Heat oven to 350°F. Grease and flour bottom and sides of 13x9-inch pan, two 9-inch round cake pans, or three 8-inch round cake pans. In large bowl, beat all cake ingredients with electric mixer on low speed 30 seconds, scraping bowl constantly. Beat on high speed 3 minutes, scraping bowl occasionally. Pour into pan(s). Rise to the occasion! If using self-rising flour, there is no need to add baking soda, salt or baking powder. 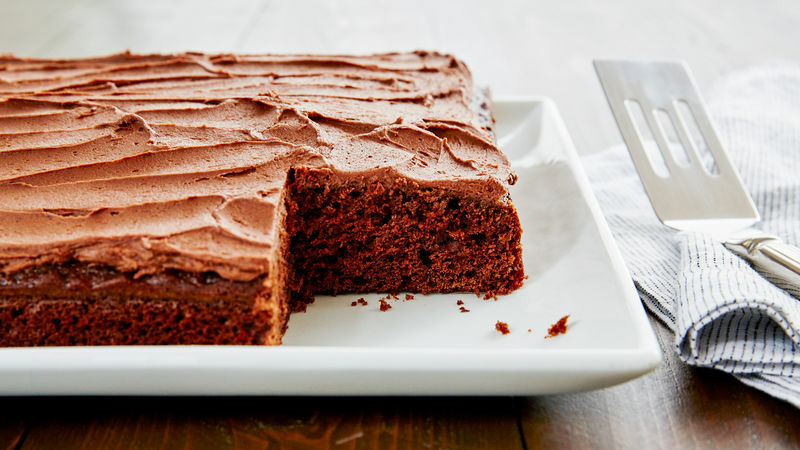 If you love chocolate-covered cherries, try this: Bake the cake in 3 layers. Reserve 1 1/2 cups of the frosting. Stir 1/4 cup finely chopped maraschino cherries into the remaining frosting; fill layers with cherry frosting. Frost cake with reserved frosting. Give the frosting a rocky road twist by folding mini marshmallows and chopped nuts into the frosting before spreading it on the cake.